Of late Magdeburg were the target of Schadenfreude. The matter though, is serious and speaks of gross neglect. Imagine your club plays THE game of the season: the derby against the local rival; think Charlton Athletic vs. Crystal Palace; Arsenal vs. Tottenham and you’ll geht the idea. Imagine the atmosphere in the ground. The weeks before are fueled by anticipation and expectation. In this bubble suddenly burst the news that the ground is not safe and the derby will possibly take place without spectators. Reason for this is the fact through their jumping on the terraces the concrete structure is exposed to stress and naturally tends to swing. However, this swinging has reached an extent where it was at one point during the week considered to be unsafe to stand there in the first place, nevermind jumping, clapping. It serves the club right that they have become the laughing stock and the supporters of Dynamo Dresden got it right in their action during the game against Bochum. Their chant “If you don’t jump, you’re Magdeburg” is Schadenfreude at its best and it is fully deserved. It was an insane stadium farce that played out during the week until Friday, the day before the match. In the end the farce was complete as fans were allowed to attend the match, though had the obligation to refrain from chanting; not even a drum was heard. Nonetheless, the atmosphere was as it is supposed for a derby: raucous. However, there is a bitter aftertaste in the whole affair. 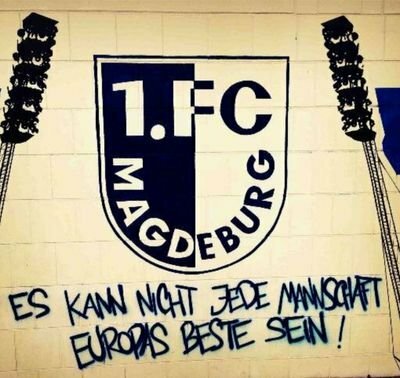 Once more fans were demanded to pay for failures of those who were responsible for this malarkey: the City of Magdeburg who is the owner of the stadium and the club as tenant.